Business-to-business boycotts are a bit tougher to deal with than a pack of consumers boycotting you. Thanks to the consumers of the industry being a diverse bunch, having a squad of liberal hypocrites boycotting you can be canceled out by others rallying for you. Game developers in a non-diverse-of-opinion industry are harder to replace. So, what are the merits here? Basically, developing for the Oculus Rift very indirectly benefits Palmer Luckey and his funding of Nimble America or other groups like that. He reportedly admits he already has a lot of money, and he's doing this for a jolly good time. 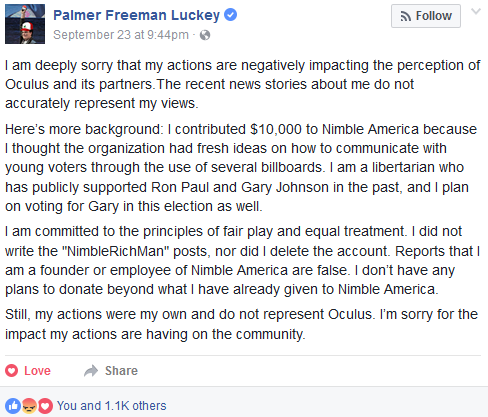 Palmer Lucky may be a Pokémon trainer and founder of Oculus, but his donations and political views only speak for himself. I guess my biggest concern here is that I'm not going to have much of a future in the gaming industry. And, given the left's collectivist orientation of screwing the whole Oculus organisation because of the personal views of its founder that have no impact on Oculus's presence as a gaming platform, that might screw over anyone else who works for or perhaps even reads KoopaTV. After all, this site has endorsed Donald J. Trump for president, and has given him financial backing, confirmed through the multiple photographs of plushies wearing MAKE AMERICA GREAT AGAIN hats. Let's be frank: It's disgusting and counterproductive that videogame developers have such a visceral reaction to revelations that someone is actually trying to do something to prevent the most anti-videogame presidential candidate in the history of the United States from achieving her quest for power. Palmer Luckey isn't even going to vote for Donald Trump. He's going to vote for Gary Johnson. It just happens that, if the goal is to stop such a vile person from ascending into power, unorthodox methods like memes-on-billboards may be the most cost-effective way (well, probably not) and joy-bringing way (that's more like it) to do that. the media and popular culture poisoning people's minds, everyone equates supporting Donald Trump and defeating Hillary Clinton with racism, bigotry, and other so-called “deplorable” mindsets. I've challenged any sanctimonious halfwit to coherently explain what about Donald Trump (or Gary Johnson) and his policy positions are more objectionable than Hillary Clinton and her policy positions. I still challenge these people, and extend that to anyone in the gaming industry. Please, explain how a Hillary presidency helps our industry more than a Trump presidency. And if you are going to put personal politics over professionalism, then maybe you're in the wrong industry. It's one thing to put your own ideologies into your work, and it's another to starve out a legitimate personal viewpoint, which isn't related to your work, from the industry. Keep this in mind: Conservatives never treat liberals this way. It's only liberals towards conservatives. Why does this particular mindset treat others who disagree with them so poorly? What benefit do liberals see in trying to drive out people unlike them out from working in the industry? Why do they not believe in inclusiveness? And how can they sit by and cheer on the ever-increasing political polarisation of America? It's stuff like having it affect business-to-business dealings that is polarising people. We shouldn't be one another's enemy. We all should ultimately want the same goals: A thriving industry, and satisfied customers. While I'm aware that some of these Trump-supporting memes are, if you take them at their word, pretty reprehensible, the point is that you're not supposed to take them at their word. Liberals would rather boycott you than get a sense of humour, though. Ludwig is probably blacklisted from working in the videogame industry for his public support of conservatism and libertarianism. So be it. He thinks pointing out the systemic intolerance and hypocrisy within the industry is well worth the professional risk. He won't go and buy an Oculus Rift, though. Ludwig currently believes that virtual reality's current business prospects are over-hyped. The REAL diversity the gaming industry needs is in thought, not gender and race. Like boycotting SodaStream really just hurt the Arab workers in the end, the majority of gamers will only end up hurting themselves. So I didn't know wot this was referencing. So I looked it up. ...Yeah, BDS is a disgusting movement, too. That said, the sources for this article only looked at this from a business-to-business perspective. The BDS movement is made by (clueless) consumers towards businesses. No source I've seen has talked about the Palmer Luckey situation from the perspective of consumers. And I thought liberals loved living in virtual reality. They do it all the time. ...CONGRATS! You've easily won your levity point for today.